This is Part IIIc of a series on training for legal translators. See the first post here. This post looks at looks at how to get better by further specialising. It’s time to find a deeper specialisation when you’re a fair way down the path discussed in Part II and Part III a) and b). By the time you get this far along as a legal translator, you’ll be familiar with the common and civil law traditions. You’ll know your way around your legal systems. You’ll know what the legal documents you most often translate look like in your target language and will be familiar with the conventions used in these documents. You will also have gotten enough feedback — one way or another — to have assured yourself that you can translate legal documents professionally, at least the ones you usually translate. You’ll probably still have work to do in these areas. Maybe there’ll be types of legal documents you’ve never translated or pockets of ignorance that you need to explore. But you’re ready to benefit from delving deeper. Finding a deeper specialisation could mean focusing on an area of law or a document type. How should you decide what to specialise in? Interests, opportunity and problem areas can help you decide. 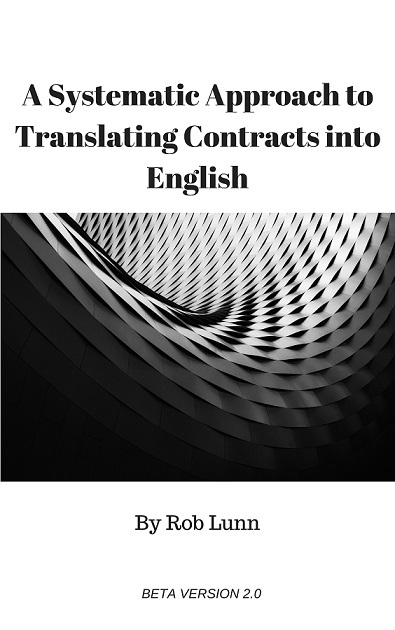 For instance, a few years ago I decided to focus on contract translation. I did so because I translated a lot of contracts and I had doubts about how best to do it (mainly about what register to use). So this is an example of how opportunity (translating contracts for clients) and a problem area (the doubts I had about how best to translate contracts) led me to delve deeper into a document type: contracts. More recently I’ve thought of doing a short course on intellectual property. Mainly because I’ve translated a lot of documents used in IP disputes. Again, opportunity gave me this idea. I have to say, though, I’m not very close to actually doing a course on IP. It just doesn’t seem that complicated, from a translator’s point of view at least. The terminology and regulations seem equivalent across languages and jurisdictions. So I don’t feel much of an urge to dig deeper. Although I know I’d learn something if I did do a course. I’d at least sort out the terminology I should be using in English. However, that doesn’t seem to be return enough at the moment. One area I am digging deeper into is notarial terms. Although in this case it feels more like I’m exploring a pocket of ignorance I should already know rather than finding a deeper specialisation. To me notaries have always existed in a mysterious realm. Even now, when I know what they do and most of the terms used to describe what they do, they still feel like fictitious creatures. And no matter how many times I translate certain notary terms, I usually find a reason to recheck old translations and definitions for the nth 100 time when I come across them again. So shaky is my footing in this area. Regardless of whether notarial terms are a specialisation or a pocket of ignorance for me, it’s another example of choosing a focus based on a problem area. I’ve got a lot to gain from learning more about notaries. It will save me time and make me more confident about my translations in the future. So specialisation is the way forward after you’ve got the basics. You can seek out and sharpen fuzzy areas in your knowledge. Or you can turn your sights to new areas. Then you just repeat as problems and opportunities arise. However, your return on investment will wane the deeper you delve. Although you will keep on getting satisfaction out of mastering (to the extent you can and need to as a translator) the different areas of your craft as you progress. Posts related to Training for legal translators. Part IIIc. How to get better.